SwimOffice comes with a Member Search function that allows non-admins (parents) to search for other accounts and members on the team so they can contact them via email or phone. This is enabled by default on non-UK teams, and disabled by default on UK teams for GDPR compliance. On Chameleon sites, users access it through the Members link at the top of the site. New CMS users access it in the side menu via Team Tools > Members Search. 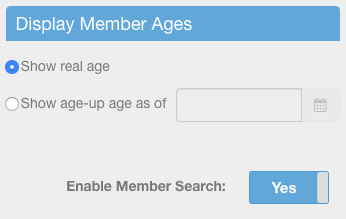 Under Display Member Ages, click the Enable Member Search toggle to Yes or No. When set to No, the Members link at the top of Chameleon sites disappears, and when new CMS users navigate to Team Tools > Members Search, they will see the message, "Member Search is currently disabled, please contact your team admin for additional information." When set to Yes, individual accounts can opt-out of the search; see the first article below.